“It’s so much easier to get my groceries without having to get the kids out of the car!” That was one of many compliments overheard from customers as Walmart opened its 2000th Online Grocery Pickup (OGP) location in Fayetteville, AR. 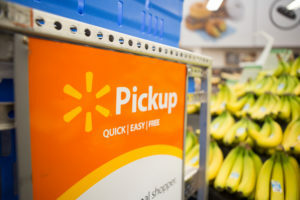 With more customers choosing the convenience of store pickup, Walmart has plans to expand the convenience to more locations and formats. As fast as OGP is expanding, has the US consumer fully embraced the service? Walmart is banking on more shoppers using OGP across the country. Walmart’s OGP lets customers order grocery items online then select a time for pickup. Once they arrive at the store, a Walmart personal shopper loads the items into the customer’s car at no extra cost. Same-day pickup is available if placed by 10 a.m. All these benefits have caused a demand for expansion and a huge rollout for Walmart. Competitiveness in the grocery market contributes to the high demand. As fierce as Amazon has been in the online ordering space, more brick-and-mortar grocers are chomping at Walmart’s heels. Aldi recently announced a grocery delivery service, going head-to-head with bigger players. Kroger now offers grocery delivery from nearly 900 of its stores and is expanding its curbside pickup locations to almost 500 stores this year (currently offered at about 1,100 Kroger locations). Stiff competition has driven Walmart to expand on OGP, delivery, and in-store pickup towers for all variety of shoppers. As Walmart launches site 2000 for OGP, it’s betting on the future shopper. Online grocery sales are an upward trend, though a slow one. Walmart is poised to stay in for the long game as analysts track customers historically slow to warm to online shopping. Looking at online grocery purchases, pickup and delivery has a promising future. In 2017, only 2% of all grocery sales were online. However, a study by the Food Marketing Institute projects online grocery to capture 20% of total grocery retail by 2025. OGP, home delivery, and in-store pickup towers are just a few ways Walmart is on track to meet the growing demand of the evolving shopper. Walmart’s OGP rollout ensures a connection with the next generation of shoppers. The company continues to marry the convenience of technology with its founding principle of customer service. Need help joining the connection? Click here to take the next step in your journey with Walmart. This entry was posted in Supplier tips and tagged Grocery, grocery pickup, online grocery, online grocery pickup, Walmart. Bookmark the permalink.